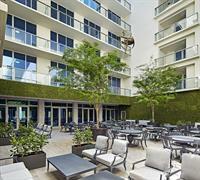 Modern style and modern technology go hand in hand at the Costa Hollywood Beach Resort. From traditional meetings to extraordinary outdoor events, we provide the ultimate venue for it all. Our ideal location just steps from the beach blurs the line between business and pleasure. Our dedicated meeting planners will help ensure your event runs smoothly, while our advanced audiovisual equipment and support are sure to impress everyone who attends.